Tabla Player Pandit Lacchu Maharaj passed away in Varanasi on Thursday. He was 72. His family members said that he was being treated at a private nursing home where he passed away at 1 AM. One of the frontline tabla players in the world, Pt Lacchu Maharaj's funeral will take place on Friday. 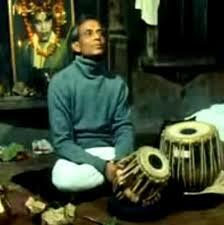 Other than his professional performances all over the world, he played the tabla in many Bollywood films. He had married French woman Teena and she, along with their only daughter, is in Switzerland. Thumri exponent Girija Devi, who also lives in Varanasi, condoled the death of the maestro and said such artistes are not born every day. Uttar Pradesh Chief Minister Akhilesh Yadav has also mourned the passing away of Pt Lacchu Maharaj.